Warriors reborn! Speedball and Justice gather a group of young heroes including Sun Girl, Hummingbird, the new Nova and a couple of fresh faces to stop the latest threat to the Marvel Universe! Atlanteans, Inhumans, Morlocks, clones and hundreds of other so-called 'superior' beings are living among normal humans - but not everyone is pleased about that. The High Evolutionary has raised an army to combat the evolution of humanity - and the New Warriors are locked in his deadly sights! If it's not human, it dies - but why? And what do the mighty Evolutionaries want with Nova? As worldwide genocide approaches and Nova encounters the captive Scarlet Spider, the Second Evolutionary War begins! Can the Warriors stop worldwide genocide? Should they? How many lives would you sacrifice to save all of humanity? Guest-starring the Avengers! 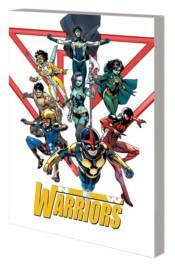 Collecting NEW WARRIORS (2014) #1-6.